This is so beautifully done, Laura. I cannot believe all of this detail is in such a small square. I picture it being like 3 feet square :). I love the design and the patterns of the material are so fun and intricate and create such unity together. Beautifully done, Ms. Autumn! Bravo! Thanks so much, Jodi! Question though – do you think the funky fabrics worked better with the wonky squares/strips? I like this one (and the colors are more me), but I feel like the wonkiness may work better with the bolder fabrics and colors. What you think? Thanks so much, Tom! Wonderful advice – and that link is a new one for me, really great! I tend to hem and haw forever on all of my color selections, and I’m hoping that as I move forward, those decisions will become more intuitive. I appreciate your time and comment!! ooh, sounds wonderful Kathy! I’d add a good book. Probably a British mystery! 😀 I’m glad you like this one. Good morning Laura, Manipulating textures with our hands is so satisfy. I can see with your small quilt you had a enjoyable time. I love the color scheme. Thanks, Sharon! Question – do you think the wonky lines/shapes work as well with the muted tones and more formal fabrics? I think it worked better in the first one, but wanted to get your thoughts. Try adding some lighter toned shapes on top of the dark shapes. Maybe the lighter fabric could be at a diagonal on the dark shapes. OK, so it’s the maroon fabric that is kind of jarring as the big diagonal? Because it’s so dark and surrounded by so much light? I guess that does tend to diminish the peaceful mood, lol…. My pleasure, have fun experimenting. I see what you’re saying, Teresa, and thanks for letting me know. The time it would take to do swirling leaves in fabric…..I don’t think anyone would want to pay that price for the resulting quilt. I agree it would be beautiful, though! I do think this type of style works best with a different set of fabrics. I had to experiment to see how it would turn out. 🙂 I actually really like this one, and would hang it in my house. But at the same time, I see what you’re saying, and I appreciate you sharing your thoughts – it’ll help me as I move forward with these little quilts! Thanks, Charlie! I’m glad you like it! Do you feel like the shapes and lines work as well with this set of fabrics as it did the other set? I need to edit this post and link back to that first quilt. I feel like the other fabrics worked better with this type of design, but was curious what you think? I thought the effect of going from a full palette to one with more muted tones using a similar motif was really cool. I think it works well. And this one stands alone. What I thought was great was that it’s also a little less wonky and bit more structured which was a nice way to move into the new palette while still giving a nod to the motif you had used in the last one. The single diagonal…it’s really cool!! Thanks, Charlie! That’s what I was going for – a bit less wonkiness in deference to the change in fabric/mood. You don’t think the diagonal is too dark? Thanks, Jill! I was curious what you’d think of this one. I like your idea re: adding light stitching to the dark areas. Great suggestion. Thank you! I cannot believe the detail in such a small size. WOW.. I really liked Tom’s input color. I like wonky, if that’s what it is! I think what makes anything good is when we create a “one of a kind”, don’t you? I totally admire your patience and ability to do this. Good job! Thank you, Leslie! Sometimes, design tries my patience. I’m definitely working my design muscles with these! Hopefully, they get stronger. I’m glad you like this! I like the color palette. It definitely says Autumn, and I think it’s cheerful. Thanks, Kerfe. I may just do it. I appreciate your thoughts. You had so many different suggestions…just goes to show we all see with our own desires. Wow, lots of interesting comments. Instinctively, I adore your quilt. The colours are “mouah!” (like a kiss). And the pattern is a touch eccentric in a way I find pleasing. When I squinted at it, as Tom suggested, the diagonal did feel quite jarring. After unsquinting, it looked kind of cool again. I guess I would be curious to see the diagonal in lighter cloth, as a few people suggested. On further squinting, I kind of like the slight imbalance in dark and light hues. I squinted and squinted and tried to imagine changing the lights and darks around and… I didn’t come up with any brilliant ideas. Interesting to think about though. Thanks, Myriam. It really helps to get everyone’s feedback as I mull this over. I hope you are not stressing the mulling. Always a pleasure to see your quilts :-). They are always beautiful and have an inherent warmth. First response: love the warm colors and wonky line. 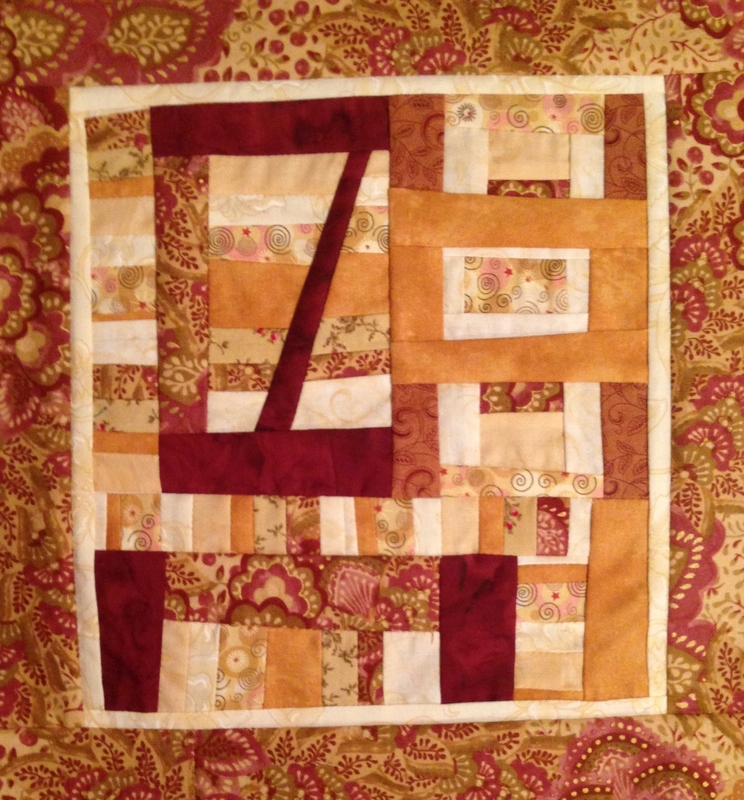 Modern type quilt. I guess it would feel nice to the touch. To me, the quilt has a feel of wood, ladder and window or barn door – because of the line across.. I am not a quilter, but take a chance in giving you my first thoughts. Adding stitching may help to bring it in a direction you want – like if you really want it to be about fall, or about building/room/table and chair types of things. There’s a lot of possibilities here. Hope you enjoy your next step! Thanks, Corinne! I appreciate your feedback. I so admire people who hand stitch and am so happy to see your quilt. Love the fall colors and how you balanced darks and lights. Thanks so much, C! I do machine piece them, but go back with hand quilting (typically)….otherwise, they really would take forever! They’re fun though. I think you’d be a natural at this, if you ever took it up. Great colors, and I love the zing of the rich darks!! Thanks, Rachel! I’m glad! I thought they may be a bit much….that dark fabric is a very cool batik and I couldn’t resist throwing it in. seriously. love. the colors are so perfect. gives such a warm, welcoming feeling… with a little bit of funky fun. makes me smile. beautiful work! Thank you so much! I’m really glad you like it! I’m feeling my way, a bit….enjoying it, though! It’s fun working small. Very satisfying. I’m loving both quilts Laura, particularly the way you have embraced “wonkyness”. Your Autumn colours are beautiful but my favourite has to be the blue one. Not only have you produced two fabulous colour schemes but the blue quilt has a more extreme wonkyness which really works for me. Thank you so much, Karen! Your work is soooo beautiful. I really appreciate your visit and comment. I sometimes feel like a stranger in a strange land, and trying to find my way with these little quilts. I do love the wonkiness; spent way too many years trying to get things perfect. I’m glad you enjoyed the color schemes as well. Thank you. Yes welcome Autumn.. The palette is feels like fall, nicely done! Thanks Jennifer! I’m having a good time with these. They take much longer than I think though! Its lovely, I hope you keep going! Thanks; I plan to, but I wonder about price and time spent, since I’m making them for what I hope will be the opening of my Etsy shop later this month. yay!! congrats to you! Wish you luck with that.. Sometimes we can’t gauge price on hours spent but instead what its worth to you and the creative process. Need to get some new stuff back up on ETSY. Thanks for the tip. I guess you’re happy with Etsy? I really need to market my shop more than I am, to get noticed. That is my only problem. I will try and add new stuff and promote it. Yeah, I bet it’s easy to get lost over there for sure. Love the shapes and the color, very Fall inspired. First thought was how nice it would be to snuggle under…forgot it was a wall hanging ;D. What ever the direction you take with finishing this piece is sure to be beautiful, you have a naturally intuitive sense. Peace and happy sewing! Thank you for your encouragement, it means a lot! It helps to have a wide stash of fabric because I’ve been quilting for over 20 years hehe. I’m glad you like this one! Haven’t even had a chance to get the beachy one together yet. Looking forward to it though! This is stunning! I loved it at first sight! Well done! Thanks so much, Margaret! I really appreciate that!